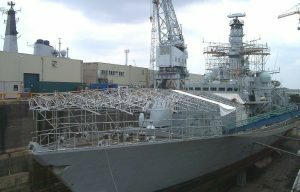 HAKI scaffolding for shipbuilding and shipyards ensures that access to refurbish vessels is safe, simple and effective. HAKI system scaffolding for shipbuilding allows for maximum efficiency in meeting scheduled deadlines and allowing for efficient access. HAKI components afford flexibility to meet design criteria for internal and external scaffold requirements to access ship hulls. The HAKI system provides worker access solutions in dry dock applications. Together with adaptable HAKI suspended scaffolding solutions, this delivers a fast turnaround with constant focus on safety. HAKI temporary shelter and roof solutions provide comfortable protected working areas for blasting, painting, general maintenance and repairs on vessels and buildings. The unique HAKI rolling roof function offers the ability to move with the project covering the area being worked on, keeping the project dry, on track and on time.